The pharmacist Sertürner first isolated morphine from opium in 1803 and named it after Morpheus, the god of dreams in Greco-Roman mythology. Ever since, it has been one of the most frequently used drugs to relieve pain, for a variety of age groups. 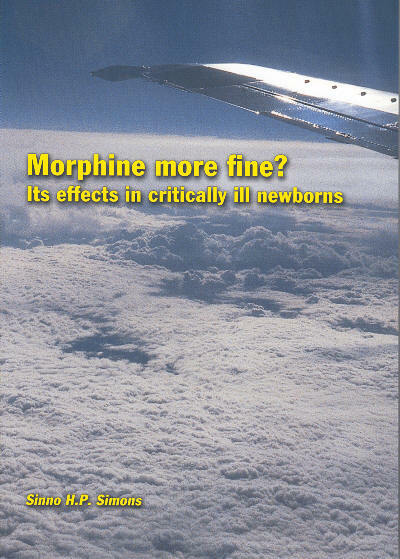 In our days, however, there is still debate whether morphine and analgesic therapy should serve as standard of care for hospitalized newborns. Until the last decade of the 20th century, premature neonates were generally believed to have little pain sensation and thus not in need of analgesic therapy. The studies of Anand et al., which showed decreased morbidity and mortality in neonatal patients receiving adequate analgesic therapy after surgery, were instrumental in altering this notion. At present it is widely recognized that even the most premature neonates can feel pain. While neonatal pain experiences have been suggested to bring about short and long-term negative consequences, analgesic therapy in the vulnerable newborns can also carry risks, such as increased incidence of seizures. This leaves us with the question whether the benefits of treatment will outweigh the side effects and potential hazards of analgesic treatment. Or, in other words, is morphine more fine? The studies described in this thesis generally aim to improve neonatal pain treatment, by investigating the beneficial and adverse effects of neonatal morphine use. They also aim at improving our knowledge of how newborns respond to pain and how to measure pain objectively: pain assessment.